Don’t want to hear “Are we there yet?” on repeat? Add some roadside attractions to your vacation itinerary. Roadside attractionsƒ2those quirky, often oversized icons—are great places to stop, stretch your legs and take a photo. And even though you’ll find roadside attractions in every state, not all of them have true kid-friendly appeal. These roadside attractions are perfect for kids who love sports, superheroes, space travel and more. They also offer a little something extra, with museums, theme parks and other attractions nearby. Just inside the DeLorme Map Company’s glass-enclosed lobby stands Eartha, a 41-foot-tall rotating globe. Designed as a three-dimensional scale model with mountains and landforms, it revolves at 23.5 degrees, just as the earth does, on a cantilever arm. For an eye-level view of the northern hemisphere, head up to the second and third floor observation balconies. The gift shop carries an extensive selection of travel toys, globes, atlases and maps. Add another oversized roadside attraction to your itinerary in neighboring Freeport, and see the 17-foot boot in front of the L.L. Bean Factory Store. With endearing vintage appeal, this 40-foot milk bottle serves as both a road trip stop and snack stand outside the Boston Children’s Museum. Weighing 15,000 pounds, the bottle was one of America’s first fast-food, drive-in restaurants when it was built in 1934. From April through October, you still order lunch and ice cream at the window. Inside the Children’s Museum, the family-focused exhibits and programs center around science, culture, environmental awareness, health and fitness, and the arts. Chomsky is the jolly, bearded fellow who welcomes you to Kelder’s Farm in the Hudson River Valley. He’s also a garden gnome, and he’s 13 feet, 6 inches tall. Formerly the titleholder of World’s Largest Garden Gnome, Chomsky is nicknamed Gnome on the Range, because he stands over the miniature Homegrown Mini-Golf course, with its unique agricultural theme. Kelder’s Farm also offers a playground and petting zoo. In season, you can pick your own fruit or pumpkins, walk through a corn maze, and take a hayride. One of our favorite roadside oddities, this big bovine welcomes ice cream fans to the Turkey Hill Experience. More of a children’s museum than a factory tour, this year-round indoor attraction shows how the company produces its ice cream and beverage products in Lancaster County, Pennsylvania. There are several more mechanical cows inside, which you can milk. Other interactive activities represent production stages, such as homogenization and pasteurization. You can stand in the blast freezer, create your own ice cream flavor, and enjoy free samples. Superman fans know the caped crusader made his home in the fictional city of Metropolis. The residents of the real Metropolis, a small town in southern Illinois, keep his legend alive with a 15-foot bronze “Man of Steel” statue in front of the county courthouse. 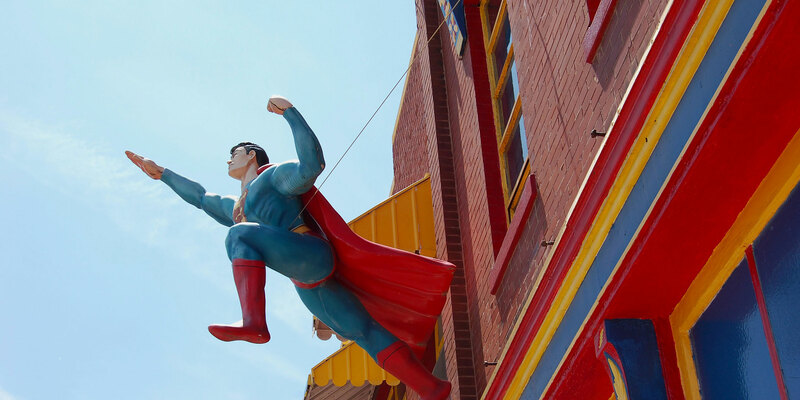 Steps away, you can visit the Super Museum, home of the world’s largest Superman memorabilia collection of costumes, movie props, artwork and posters, stills, toys, games, and action figures. Frankenmuth, known as Michigan’s little Bavaria, oozes with the charm of German-themed attractions, shops, restaurants promising world famous chicken dinners, and events like Oktoberfest parties. In front of Frankenmuth Cheese Haus, a cheerful grey mouse peeks his head out of a six-foot wedge of Swiss. It’s actually made of cement, but inside, you’ll find real Swiss, along with 140 other cheese varieties, including cheese spreads and even a homemade chocolate cheese. This 120-foot-tall scale replica of the bat that was custom made for Babe Ruth in the early 1920’s identifies the entrance of the Louisville Slugger Museum & Factory, located in Louisville‘s historic West Main district. As the official bat producer for Major League Baseball, the company has been crafting bats since 1884. The museum shows how the sport has changed over the past 130 years. Guests of this road trip attraction can also visit a replica dugout and face down a 90-mph fastball, climb through a giant ball glove, watch bats being made, and hold bats used by their favorite players. You’ll see the giant orange T-Rex long before you drive up to the entrance of Dinosaur World in Glen Rose, the official Dinosaur Capital of Texas. Dinosaur Valley State Park—where dinosaurs actually did roam—is located next door. Families can walk the forest trail, filled with more than 100 life-sized beasts and fact-filled signs. Kids can get their hands dirty at the Fossil Dig while they uncover bone fragments, shark teeth and shells. You can also visit the indoor Prehistoric Museum, gift shop, picnic area and playgrounds at this roadside attraction. There are also Dinosaur World locations in Cave City, Kentucky, and Plant City, Florida. 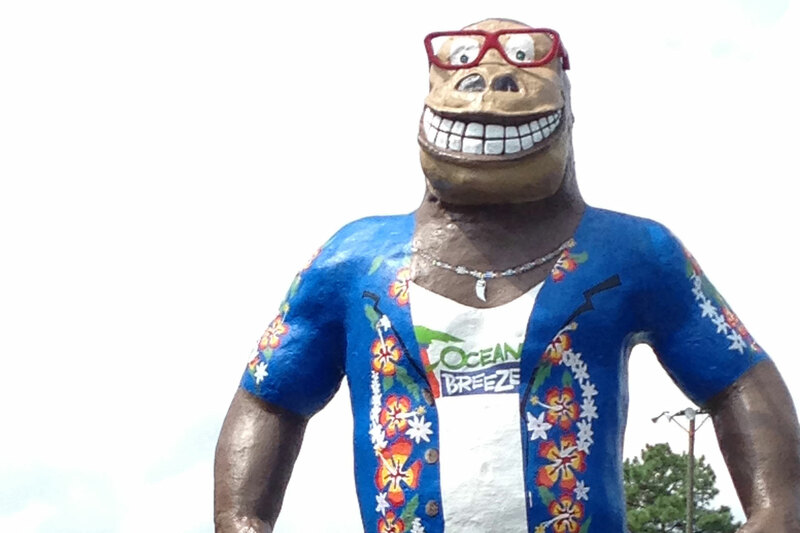 Hugh Mongous is the grinning, 45-foot-tall mascot standing in front of the Ocean Breeze Waterpark in Virginia Beach. Since his arrival in 1977, he’s survived a blaze and has been re-painted several times. He now dons a Hawaiian shirt, shorts and sunglasses, as he greets visitors to this seasonal water park. Walking through the seaside village-themed setting, you’ll find the one-million-gallon Runaway Bay wave pool and 16 waterslides. Preschool play includes the Buccaneer Bay Water Playground and the Little Amazon lazy river. 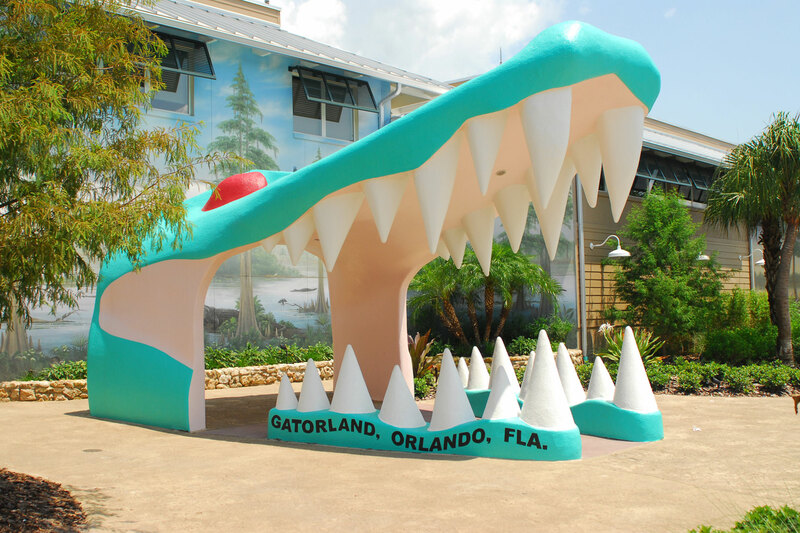 Immense alligator jaws at the entrance of Gatorland in Orlando have yet to deter visitors from stopping in to this historic, 110-acre theme park and wildlife preserve. What was once a small alligator pond in 1949 has evolved into the Alligator Capital of the World, and is now home to thousands of alligators, crocodiles, an aviary, petting zoo and breeding marsh with an observation tower—making it one of the best roadside attractions in America. Guests can participate in nature walks or educational programs, or watch the gator wrestling shows. Modern rides and attractions include the Gator Gully Splash Park and the 287-foot-high Screamin’ Gator Zip Line. From Highway I-565 in Huntsville, Alabama, a replica of the 363-foot-tall Saturn V moon rocket will make you crane your neck toward the sky. Stop at this roadside attraction to get a better look inside the U.S. Space & Rocket Center, where the real Saturn V, now a National Historic Landmark, is also displayed. Home of the SPACE CAMP program, the USSRC is the largest museum in the world devoted to space artifacts. Fun attractions let you land a shuttle, jump 30 feet in the air in a space walker, manipulate a robot arm and view a real Moon rock. Kids can experience G-force and weightlessness on “Space Shot;” scale the Mars Climbing Wall or sit inside the Apollo Cockpit Trainer simulator. Another one of our favorite roadside oddities, this is the world’s largest whale skeleton, arching 18 feet high and stretching 87 feet alongside the exterior of the Seymour Marine Discovery Center in Santa Cruz, California. This female blue whale, affectionately now known as Ms. Blue, washed up on a beach 30 miles north of the facility in 1979. Inside the Discovery Center, you can visit several exhibit halls, an aquarium and touch tanks, including the shark pool, which contains friendly Swell Sharks. Thirty-minute guided family tours are geared for younger visitors. Yes, there are family-friendly attractions—including fantastic road trip stops—in Las Vegas. On the Strip, the Showcase Mall offers a mix of retail and entertainment suitable for all ages. To find the mall, just look for the 100-foot glass Coca-Cola bottle, and ride the elevator inside it to the Outback Steakhouse restaurant. The Coca-Cola store itself is chock-full of merchandise, along with a soda fountain where you can create your own Taste of The World from a selection of 130 different flavors. The Mall also houses a four-story M&M’s World store, a Hard Rock Cafe and a movie theater. This North Dakota town’s claim to fame is the world’s largest buffalo, a cement sculpture that weighs 60 tons and measures 26 feet tall by 46 feet long. Dakota Thunder greets visitors to the National Buffalo Museum, where the exhibits focus on the history of bison in the plains culture, with displays of Plains Indian artifacts, prehistoric bison remains, and a children’s room of North Dakota wildlife. The museum also maintains a live bison herd with White Cloud, a rare albino. The complex includes Frontier Village, a collection of historic buildings that includes a post office, trading post, saloon, firehouse and jail. Stagecoach and pony rides are offered in the summer. You can find this sizable St. Nick at the Santa Claus House in the Alaska town of North Pole (yes, that’s its real name), 13 miles south of Fairbanks, Alaska. The 42-foot, 900-pound fiberglass statue and road trip attraction has stood here since 1983, although he was originally built for the 1962 Seattle World’s Fair. There’s a live Santa here, too, as well as some of his reindeer, all year long. You can also have a letter delivered from the North Pole zip code, shop the Christmas merchandise, and grab a snack at Santa’s Coffee Cache. In 1999, when Disney released a remake of the movie “101 Dalmations,” they installed a big spotted fire hydrant at Disneyland to promote the film. 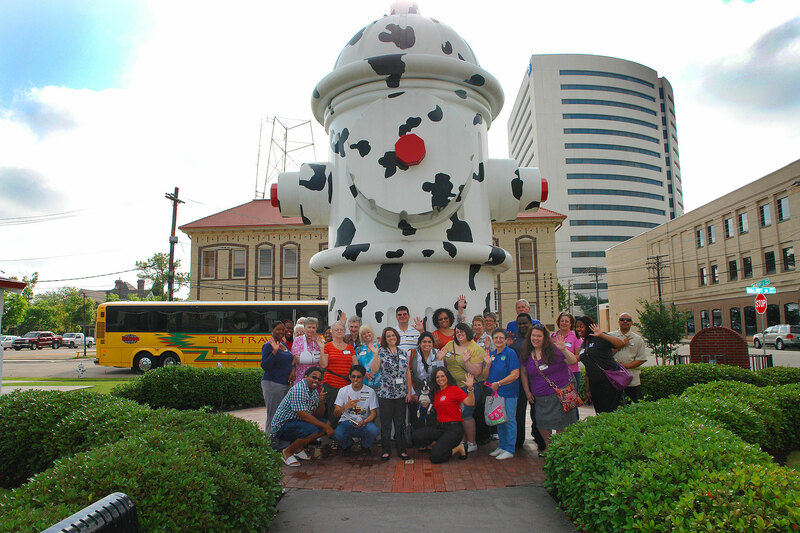 When Disney no longer needed the fire hydrant, the company offered to donate it to another cause. More than 300 museums responded. The Fire Museum of Texas in Beaumont won. It stands 24 feet tall, weighs 4,500 pounds and can spray 1,500 gallons of water. (There are two taller fire hydrants in the world—one in Manitoba, Canada and another in South Carolina—but they don’t work.) Kids can play in the spray the first Saturday of October, the beginning of Fire Prevention Week. Al Johnson’s Swedish Restaurant in Sister Bay, Wisconsin, prides itself in offering an authentic Swedish experience, including the sod roof on the restaurant. (Sod roofs are common in rural Scandinavian countries, but not so much in North America.) But the real attraction is the small herd of goats that graze on top of the restaurant in the summer. They spend their day mowing grass on the roof, but come down every night and sleep in a comfy barn (where they also spend their winters). There’s nothing like seeing the rooftop goats in real life, but a goat cam on the restaurant’s website shows the live grazing action. On your way to or from Oregon Caves National Monument in southern Oregon, you’ll likely pass through the town of Grants Pass, where a 17-foot tall caveman greets you. 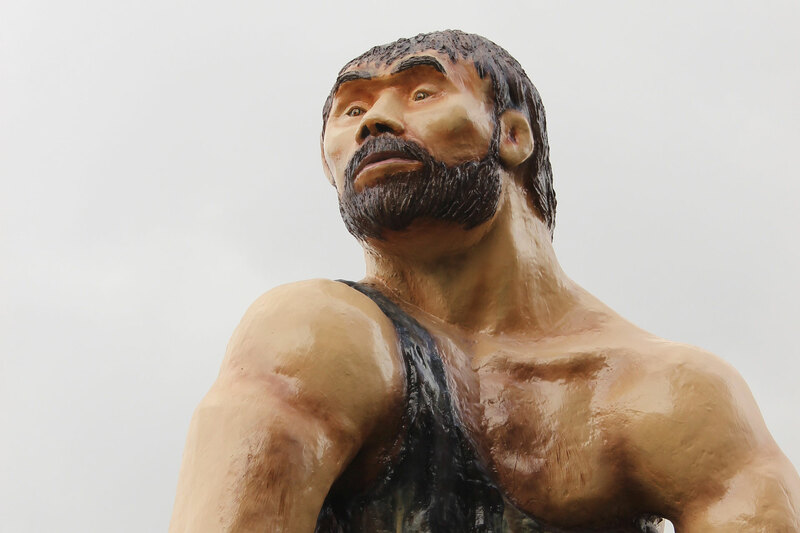 The pelt-wearing Neanderthal has been a part of the area’s landscape since the 1970s as a tourism promotion, and inspired the Grants Pass High School to adopt him as its school mascot. A summer visit to Catskill, New York, is the ideal destination for cat lovers. 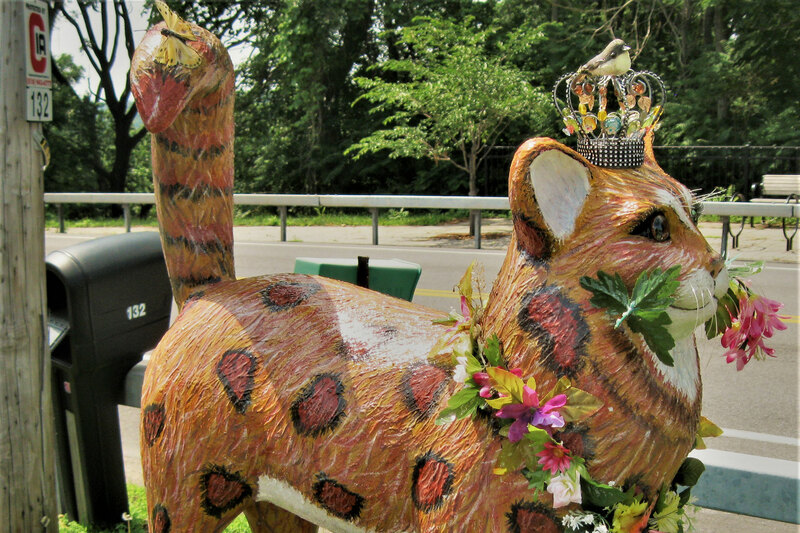 That’s when about 50 fiberglass felines appear on the streets of Catskill as part of an annual public art project called Cat’n Around Catskill. Disguised in some incredibly creative interpretations of our world today, you may encounter designs from international cultures, local Catskill scenery and folklore, cartoon characters, flower gardens, a unicorn, mermaid, ballerina, and more. In the neighboring town of Cairo, you’ll find a similar public art display with fiberglass bears. Charlie Bottoms was a real man who lived in Dumas, Arkansas, and was a genius with automotive engines, despite having significant learning disabilities. Charlie’s family built this 26-foot tall tire man to honor Charlie and bring attention to his shop on U.S. 65. In 2005, a tornado wiped out Charlie the Tire Man, but the family rebuilt. Charlie Bottoms has since passed away, but Charlie the Tire Man remains a very popular member of this southern Arkansas community. Some of the best strawberry shortcake you’ll ever eat is one reason to drive to Strawberry Point, Iowa. It’s served in the historic Franklin Hotel from strawberries picked at local U-pick strawberry patches. Come during the Strawberry Days Festival in June for more juiciness than imaginable. 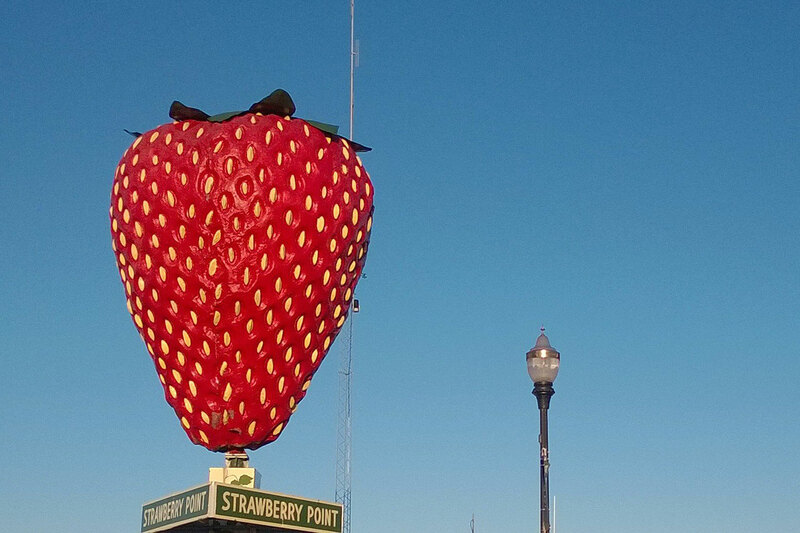 And of course, you can’t leave until you take a family photo in front of the world’s largest strawberry. It’s 15-feet tall and bright red. You can’t miss it. Red Wing, Minnesota, is home of Red Wing Boots, a sturdy shoe company in business since 1905. When the company turned 100, employees celebrated by making a size 638.5 D boot. It stands 20 feet tall and, yes, is the world’s biggest boot. But don’t worry. They’ve got itsy, bitsy baby ones, as well. A 4D is the smallest they make. Huron, South Dakota, is out in the middle of the prairie, which is home to lots of pheasants. Therefore, the people of Huron welcome you to their community, once home to former Vice President Hubert Humphrey, with a big fiberglass pheasant. He weighs 22 tons, is 28-feet tall and, from his beak to his tail, his feathers stretch 40 feet. We’re pretty sure that makes him the world’s largest pheasant, and although he’s not yellow, a really big bird. In Idaho, you have to have a museum about potatoes and that requires a really big potato out front. The original potato at the Idaho Potato Museum was just that—a basic spud. But a few years back, they made it a baked potato with a mountain of sour cream and butter on top. Yum! The butter is an artery-clogging, two-foot square, which is just about the right size when your potato is more than 10-feet tall and 20-feet long. Come in September for Spud Days to see additional toppings like cheese, bacon and broccoli join the potato parade. Feed your kids to the sharks at Sharkheads, a popular gift shop on Beach Boulevard (Highway 90) since the 1990s. Technically, it’s a Great White Shark whose bite is 26 feet wide and 32 feet tall. During the holiday season, Santa poses for photos in the shark’s mouth for anyone who wants that image on their greeting card. Inspire the creativity in your children with a drive through Lakenenland on Highway 28 east of Marquette in Michigan’s Upper Peninsula. This is what happens when a junk yard collides with an art gallery and it all takes places on some wooded acreage designed for fun. Some of it makes sense—like a pig riding a unicycle or red wolf doing back flips—but some you’ll just have to use your imagination, like Tom Lakenen did when he created this odd, but lovable collection. If you’re one of those families who likes to check off a list of “world’s biggest” when you travel, set your GPS to Casey, Illinois, about halfway between St. Louis and Indianapolis on I-70. The little town is home to the world’s biggest rocking chair (56-feet high), the world’s biggest working mailbox (according to the U.S. Postal Service), and a pencil way too big to fit in your child’s backpack. At last count, Casey was home to eight Guinness Book of World Record champions, including a pitch fork, wooden shoes, a golf tee, and knitting needles. He entered this world as perhaps the oddest anniversary gift that any husband has given his wife, but that’s exactly how the Big Blue Whale came to be in 1972. From his little pond, Blue smiles at travelers along Route 66 in northeast Oklahoma. Hugh Davis originally built slides from the whale’s sides so that children could swim and play in the pond with Blue, but that is no longer allowed. Although this is private property, there is a parking lot for you to pull in and get better photos. Occasionally food trucks set up in this parking lot.